As the title suggests the search is on, no not for the Malaysian airliner that's been abducted by aliens, what an incredible mystery that's turning out to be, but a search nearer to home for early spring migrants. Lovely weather over the weekend has raised the anticipation levels considerably but to be honest the winds have not been too favourable for us here in landlocked Warwickshire. Still, a healthy haul of Chiffchaff, with six singing birds on Saturdays tour of the reserve and three today isn't a bad lot. New Hare Covert produced a ♂Blackcap on Saturday morning, but with the lack of song perhaps this is one of the wintering birds from Central Europe. Ringed Plover are late arrivals for Brandon this year but it seems that two pair of Oystercatcher are settling in for the duration and a solitary Redshank has been coming and going. My earliest date for Sand Martin has come and gone but I expect the first birds are imminent. So from a Brandon perspective the waiting goes on. Little Grebe - One of three on Carlton Pool Saturday morning. Away from the migration several butterflies were on the wing today with Brimstone, Small Tortoiseshell, Comma and Peacock all recorded. I was on the wrong side of the reserve first thing today and so missed a Little Egret on East Marsh Pool but on Saturday morning three Little Grebe at Carlton Hide were nice to see. Closer to home the Yellowhammers and Skylarks are in full song and a nice surprise in the marina car park when I arrived back from Brandon this afternoon. I'd noticed an interesting looking bird perched on the phone wires but in almost direct sunlight. 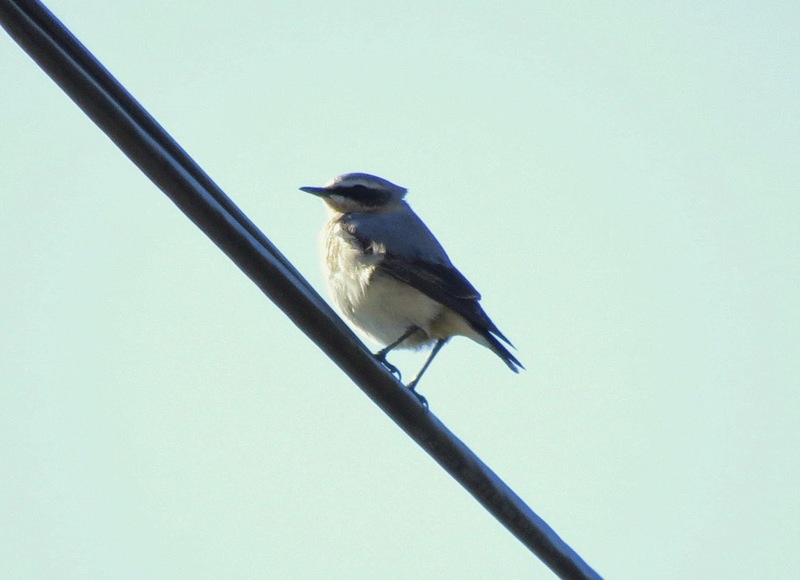 However, after re-positioning myself I managed this shot of my first Northern Wheatear of the year with my now trusty Canon SX50.... Keep watching the skies! !